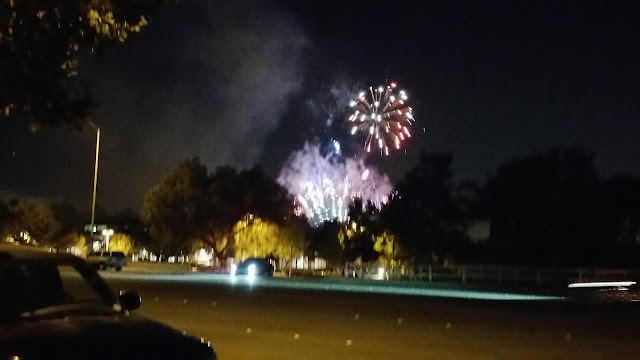 Standing on the side of Yorba Linda Boulevard, holding Boy Two while Boy One wrapped himself in a blanket, I leaned into my man and watched the fireworks. Next to me, a father held his young son on his shoulders, quietly singing, "Happy Birthday, America." They have part of a conversation in another language, then switch back to English. "How old is America?" the father asks. "That's right!" exclaims his father, then they stop, and continue to watch the burning elements explode across the sky. This, to me, is the beauty of America. Here, on the side of the road, my fourth or more generation, WASPy boys standing side-by-side with the children of imigrants, celebrating the nation's birthday. May we all continue to stand together. Happy birthday, America. Happy birthday.